1. Name of the adoption agency: The name of the agency that submitted the adoption application to CCCWA. 2. Travel Notice number: the serial number on the upper right corner of the Notice of Coming to China for Adoption. 3. Date of issuance of Travel Notice: the date under the seal of CCCWA at the right bottom of the Notice of Coming to China for Adoption. 4. Number of times report have been made: tick the square before the number. 5. Chinese name of the adoptee: pinyin in the original copy, and Chinese characters in the translated copy. 8. Health status at adoption: tick the square to specify health condition or special needs. 9. Adoption registration date: Date of adoption registration as shown in the Adoption Registration Certificate. 10. Date of naturalization: Date as shown in the naturalization certificate of the adoptee. 11. Adoptive father's name: name as listed on the passport; no abbreviations. 12. Adoptive mother's name: name as listed on the passport; no abbreviations. 14. Date of completion: date when the report was finished. 15. Adoption agency which prepared the report: if it's the same agency as in item 1, please specify “same as item 1”. 16. Agreement/Disagreement with CCCWA’s using the report and photos for publication. Preparer of the report ticks the appropriate square after obtaining the opinions of the adoptive parents. 1. 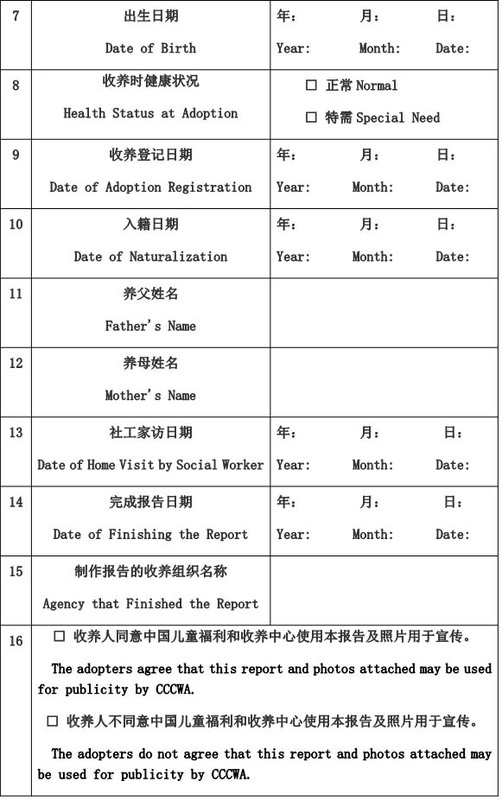 The report at one month after adoption should focus on the initial integration of the adoptee with the adoptive family and the adjustment of the adoptee, with description of the registration procedure in China, such as impression and feeling during the adoption process. The report should also include how the adoption agency helped with the adjustment in the initial stage. 2. Health and physical development status: Adoptee's height, weight, and head circumference at the time of adoption and currently, fine motor skill ability, immunization, treatment and rehabilitation of recently occuring diseases, etc. For families who have adopted special needs children, in the report at twelve months after adoption, families should fill in the table Feed-back Table of the Child with Special Needs and elaborate on the implementation of a medical rehabilitation and nurturing plan during the first year after adoption. 3. Routine activities: Adoptee's diet, playtime, and sleep schedule. 4. Attachment & bonding situation: Status of the adoptee's integration with his/her parents, siblings, and family. Particular details should be provided if the family has adopted a child over 3. 5. Mental development: Adoptee's mental development and language ability. 6. Character development: Adoptee's psychology and personality characteristics. 7. Education situation: Adoptee's learning at home, kindergarten, and school and the method of education at home. 8. Family's impression: Understanding and view of the adoption by the adoptive parents, other adults in the home, and other relatives. 12. Social worker's general evaluation: social worker's recommendation of the adoptive family and general evaluation regarding whether the adoption is successful. 1. 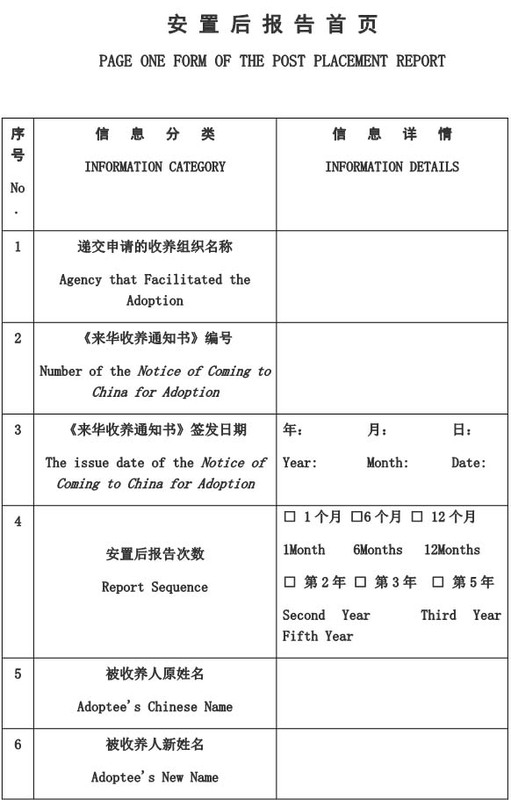 Copy of the Notice of Coming to China for Adoption (submitted together with every post-placement report). 2. Naturalization of the adoptee (submitted once together with the post-placement report after the adoptee completes the naturalization procedure). Certifications which can be considered as naturalization certificates include: naturalization certificate, copy of citizenship ID, copy of the adoptee’s passport, copy of the family's household register book. 3. A short essay written by the adoptee if he/she has reached 10 years old, describing his/her experience and growth in the adoptive family, and how he/she is doing in school and getting along with his/her teachers and classmates (submitted together with every post-placement report). At the time the post placement report is submitted, eight pictures (15.2 cm×10.2 cm) reflecting the adoptee’s life should also be provided. The pictures should be mainly about the life of the adoptee together with the adoptive parents and other family members, some of which should reflect the typical features of the receiving country. In the first report, the photos should include those taken when the adoptive families went through registration procedures in China. Black-and-white photos or photos typed on paper are not accepted. Photos should be pasted to A4 paper with two photos on each piece. A brief description must be provided below each picture specifying time for taking the photo, location, identity of the persons on the photo. Do not submit photos in piles or stapled together. No album will be accepted. The four sections of each report should be bound in the above-mentioned sequence. If a Chinese translation is going to be submitted as well, the Chinese copy should be bound in the same sequence as the original report, and should be put before the original one. Page One form of the Post-placement Report, Feed-back Table of the Special Needs Child and Medical Checkup Certificate of the Adoptee can be downloaded from the website of CCCWA.